When most people think of swimming for fitness they picture Olympic athletes like Ian Thorpe, Michael Phelps, or Canada’s own Mark Tewksbury. Those excessively lean and fit individuals who perform at the elite level of the sport. This is a bit distracting and daunting for regular swimmers or those interested in swimming . If this was your first thought of swimmer, you too would have second thoughts before sporting that swim suit and getting in the pool. 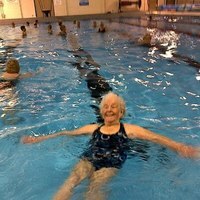 If you are one of those people, or even a passerby whom is keen, let me introduce you to the world of Masters Swimming. Masters Swimming is a coached, organized, adult program intended to promote fitness through the sport of swimming. Masters Swimmers are comprised of all types of athletic and non athletic swimmers ranging from former world champions, age groups (youth competitive swimming), tri-athletes, fitness, and casual swimmers. It is open to and designed for anyone who is able to complete a few simple lengths of a pool non-stop. You don’t have to be fast, good, or competitive to be a Masters Swimmer. So why swimming? There are lots of activities out there a person can pursue to be fit. You can run, weight training, biking, hiking, hockey, volleyball, etc. All these are great and well worth pursuing but none offer the low impact that swimming can. Swimming – especially in a structured workout – offers a low impact activity that builds endurance, strength, and cardio-vascular fitness. This allows reduced strain on joints while still allowing a full body exercise. There are also psychological benefits to swimming. At a slower pace where you are not working as hard you can relax and let your mind wander, focusing on nothing but the rhythm of your stroke. This provides a meditative state. A less obvious side benefit you can also gain is time management and self discipline. Having to schedule around practice so you can attend, keeping on the pace of the practice, Some people even find it a stress reliever to swim, refreshing them for the day. As part of a masters club, swimming offers a great social outlet and camaraderie through the shared workout experience. You can get coached guidance on your stroke techniques allowing you to improve and in some case swim strokes you never thought you would. You can set goals such as swimming a distance faster, entering a master’s competition (100% optional), mastering a stroke, or building endurance. The costs of swimming are also great when compared to some other types of activities. The cost of a swim suit and goggles is often much less than a good pair of running shoes. The membership costs of a Masters club also are much better than your typical fitness center. The things swimming can’t offer you are muscle growth and a high level of weight loss. While you will build strength you won’t build muscle like a weight lifter would and while you will drop weight through swimming, there is an upper limit. Both these limitations are the reality of being supported in the water gaining less resistance than free weights and due to the nature of the cooling effect of water. So if you have not considered masters swimming as part of your fitness routine you should! Either as your primary workout or as a part of cross-training it has something to offer you. Join our team now and start the benefits of Masters Swimming!